In the Disney movie Pocahontas, the titular character takes advice from a talking tree and ends up defying her tribe. The movie's not historically accurate, but I'm just throwing it out there. Critical as it may be to the first season, I've never been a huge fan of this sequence. The notion that Matt could be convinced to turn against Tai seems too far out there to enjoy responsibly. It's great melodrama to be sure, but it's hard to really buy into Matt going that far off the ledge. It creates a level of hostility within the group that no subsequent season ever reaches, but it's just too much of a stretch for me to buy into it as an objective critic. Dismissing it would be giving up too easily, however. So, being an objective critic, I'm going to do some deconstructive analysis and really hack into Matt's brain here. It's still a bit of a stretch, but there's a very interesting lesson at the end of a dark path. To summarize the episode, after TK escapes on his own, Matt distances himself from the group and questions his purpose, believing that everybody else has grown stronger. Puppetmon minion Cherrymon works him, convincing him that the only route to self-improvement is conquering his rival... which Matt perceives to be Tai. 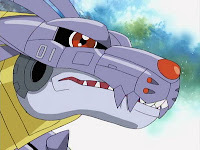 Gabumon pledges his unconditional support and Matt charges back to the group and orders MetalGarurumon to start a fight with Agumon. The rest of the group spends the episode fighting some Garbagemon or whatever. Let's start with the impetus for Matt running off- TK taking care of himself. Quick- think back to all the times when Matt and Tai have really gone at it. How many involve TK in a central role? Answer- all but one. It goes beyond the obvious examples too: in episode 7, Matt didn't want everybody (read: TK) to have to scale Infinity Mountain. In episode 23, Matt was pissed that he was stuck in the diner instead of returning to TK. The only exception was last episode, when Tai wanted to move along rather than let Mimi honor the fallen Digimon. All of the other incidents involved Matt trying to protect TK, or being frustrated in his failure. This time, when it turned out that TK didn't need protection, Matt was frustrated yet again. But instead of the realization that Tai was right about TK all along, the argument freshest in Matt's memory was an unrelated one, in which he still thought Tai was wrong. The argument over Mimi's memorials was very significant. Not only did it up the stress level, it provided the fodder Matt needed to see Tai as the rival in the water, rather than a reflection of himself. The idea central to Cherrymon's ploy is that Matt has yet to improve himself the way the others have. Self-improvement in the series has usually been represented by a new level of evolution. Everybody has to step up and display a new side of themselves to get this. 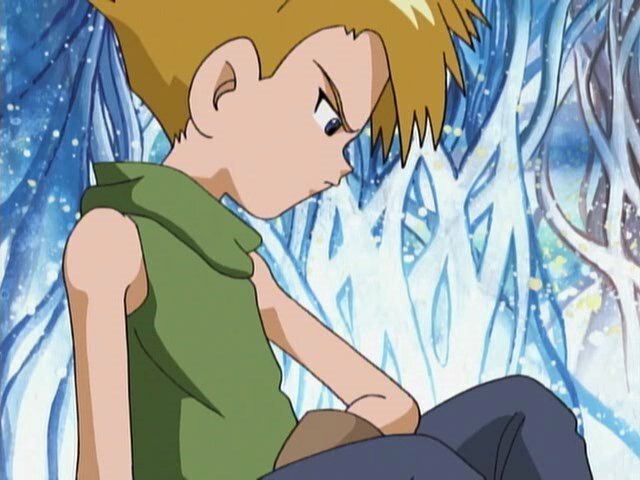 There is, again, one exception: Matt submitting to an arrow from Angemon had nothing to do with his crest. You can make the argument that Tai going through with it took extreme courage and therefore works (or, more likely, it's Tai and he doesn't dwell on this sort of thing). 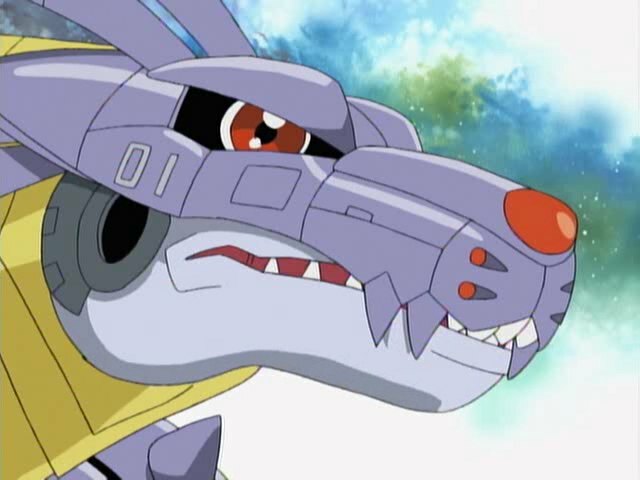 Point is, unlike everybody else, Gabumon's final digivolution arose from some arbitrary prophecy: Matt didn't earn it, and deep down he knows it. Furthermore, power that isn't earned is more likely to be abused, which Matt also illustrates when he rides his unpaid Mega into battle against Tai's. Either that or this whole showdown's some overdramatic spectacle and we should sit back and enjoy it. I don't care for potty humor, but the “toilet talk” presented here is quite logical and understandable. Joe sees Matt leave, but doesn't think about it, chalking it up to a routine bathroom break. Besides the stuff in the last episode, Tai doesn't help his case much here. He demands that Matt be found, even when Gatomon suggests that he needs some private time, given how stressed he's been. When the Garbagemon use their sludge attack, Mimi initially stood her ground when everyone else retreated. Given her special relationship with the Numemon, it was almost a moment of pure awesome for her. Then she ran away anyway. Whether it worked or not, gotta hand it to the kids for leading the Garbagemon into a truly vicious ambush. Now we're getting into Puppetmon's frightening side. Cherrymon, clearly very perceptive and intelligent, notes that the digidestined are strong and shouldn't be underestimated. 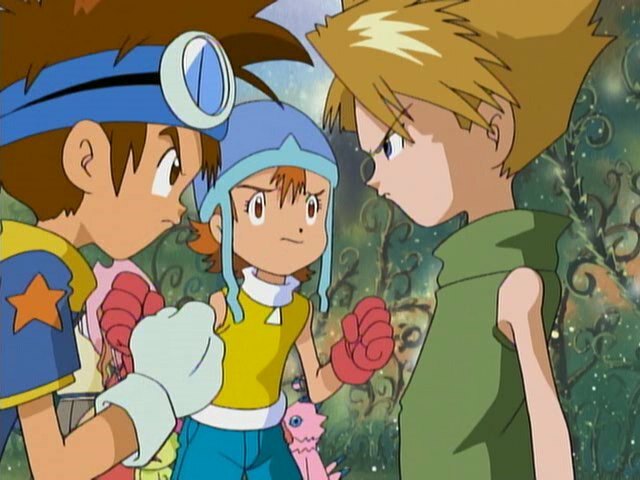 Puppetmon, moments after reveling in Matt turning on his ally... immediately turns on his own ally, perceiving the mere suggestion that the kids could win as an unforgivable insult. Dub Cherrymon is made especially awesome due to all the Marlon Brando references. The horror! I have to respectfully disagree with your notion that Matt didn't earn Gabumon's Mega evolution, to an extent. Simply submitting to being shot with an arrow would definitely be courage only, but remember there was another factor; that bromantic hand-holding you mentioned. Matt was the instigator of that, and once you look past the fanfic fuel, it was pretty much Matt admitting "I'm scared and I need your help to get through this", even if he claims that it's to keep Tai from running away. Tai is willing to offer his support there, and frankly seems grateful for Matt's support at the same time. The two are able to put their pride on the shelf and turn to each other for the strength they need to face the unknown. All this I think would count as exemplifying friendship AND courage. I think it's also significant that they both display these two traits. It ties in to what Matt says later in the season about how the crests are powered not just by the trait within the crest holder, but by that same trait coming from the others around them. However, perception counts, and if Matt doesn't see all this, and believes that he didn't truly earn this power, even if I would say that he did, then we're right back at square one. Or maybe I'm also making too much of an overdramatic spectacle. On a totally unrelated topic, Mimi standing her ground against the Garbagemon was one of the funniest moments in the season for me. Puppetmon's WTF look watching her do this just clinches it!